WonderRoof™ is a proprietary, high-quality acrylic urethane coating for roof decks. Fully resistant to acid rain, cooking fats, jet exhaust and other environmental contaminants, WonderRoof™ is ideal for industrial buildings, warehouses and other large-scale flat commercial rooftops. With high-quality fillers like silica and titanium dioxide, WonderRoof™ offers super chemical resistance and UV light reflectivity, reducing solar heat absorption by up to 96%—offering huge savings in energy usage and cooling costs, year after year. This same technology is flexible and durable, well-outlasting all other roof coatings. Our special formulated urethane material prevents the movement and erosion that causes other roof coatings to fail. This formulation also provides the highest UV reflectancy to protect the roof while also lowering energy costs. In addition, our double-patented primer system prevents mold and mildew, further extending your roofs life. 10-YEAR GUARANTEE Thanks to the proprietary science behind WonderRoof™, our coating creates a chemical-resistant and waterproof impermeable membrane. It adheres well over all types of roof surfaces and is a proven life extender for aged EPDM roofs. ENERGY EFFICIENT WonderRoof™ is energy efficient, dramatically reducing solar heat absorption by up to 96% in both air-conditioned and non-air-conditioned buildings. It takes the majority of the heat load off a building’s skin and reduces temperatures to the equivalent of outside shade, providing enormous energy and cost savings. 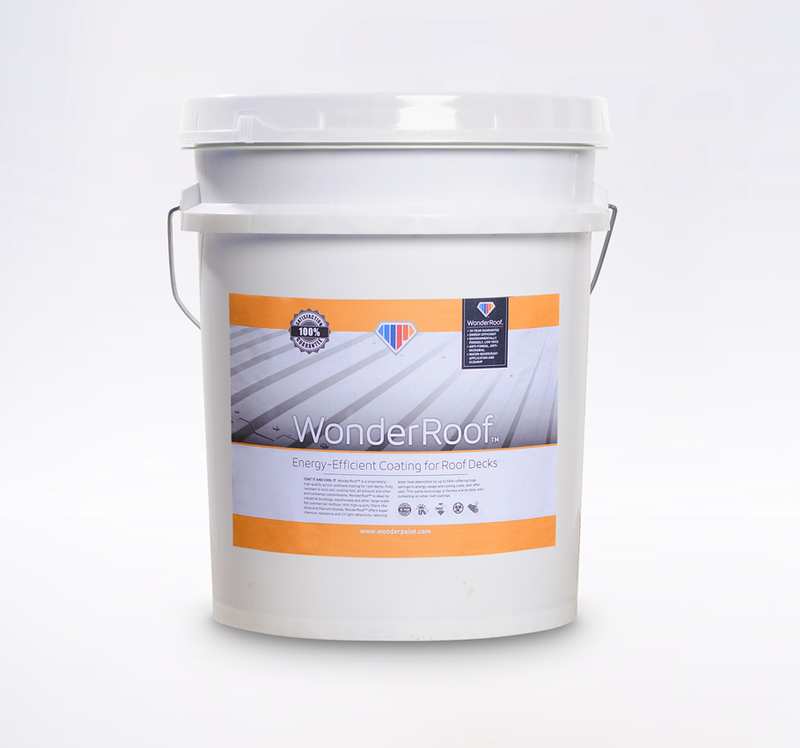 ENVIRONMENTALLY FRIENDLY, LOW VOCS WonderRoof™ is environmentally friendly, non-toxic, readily biodegradable, non-flammable, free of calcium carbonate, extremely low in VOCs and safe for the environment. ANTI-FUNGAL, ANTI-MICROBIAL Anti-Fungal, Anti-microbial WonderRoof™ contains ingredients that make it impossible for mold or mildew to form once the product has been applied and cured. This keeps mold and mildew from destroying the integrity and appearance of the surface. WATER-BASED - EASY APPLICATION & CLEANUP WonderRoof™ is water-based and environmentally friendly, making it easy to apply and clean up using just mild soap and water. I have built my business as a problem solver for my customers mostly due to the unique qualities of the WonderPaint products. WonderPaint allows me to succeed where other contractors have failed giving me a leg-up on my competition.